Thanks to the registration of skin cancer pathology reports, the biggest database on skin cancer in the world now exists through Public Health England (PHE) with input from the devolved nations. In order to build on this resource a new UK Keratinocyte Cancer Collaborative (UKKCC) is being established with support from the British Association of Dermatologists. We find out more from Dr Paul Craig (Consultant Histopathologist, Gloucestershire Hospitals NHS Foundation Trust). Tell us about the aims of this work. We are planning to develop a UK-wide network of centres of excellence in cutaneous dermatology, oncology and pathology. This will help support a national ‘virtual’ Biobank for the study of molecular pathology developments in clinical practice. This will also facilitate research projects from researchers and within translational clinical trials. Non-melanoma skin cancer is the commonest cancer in Western Society. In 2016, in the UK population of over 64 million, there were over 230,000 new non-melanoma (keratinocyte) skin cancers (KC) including over 45,000 squamous cell carcinomas (cSCC). Current figures are a gross underestimate of the large workload for both dermatologists and pathologists. What sort of project might this support? As an example, 1,700 cases of metastases have been found within the PHE database. A prospective study is proposed to create a (consented) collection of primary invasive and metastatic cSCC. These would then be used for genomic, transcriptomic and immunological profiling to identify drivers of metastasis and deliver robust criteria for pathological prediction of risk of lymph node metastasis. Identification of disease mechanisms may lead to new treatment regimes for patient benefit, and future pathological resources will then be available for translation within novel clinical trials. This could also allow stratification of patient pathways so those at low risk of progression could receive less intensive follow up, which would impact on clinical services. How can collaborators get involved? We would be very grateful if you could contact us if 1) you have biobanked fresh and/or paraffin embedded tissue from primary cutaneous SCC (i.e. skin specimens) and/or metastatic cSCC (usually in lymph nodes but also in skin and soft tissue) in your biobank and 2) if you would be able to biobank these specimens prospectively. Please contact Dr Paul Craig (Consultant Histopathologist) and Prof. Irene Leigh (Professor of Dermatology). 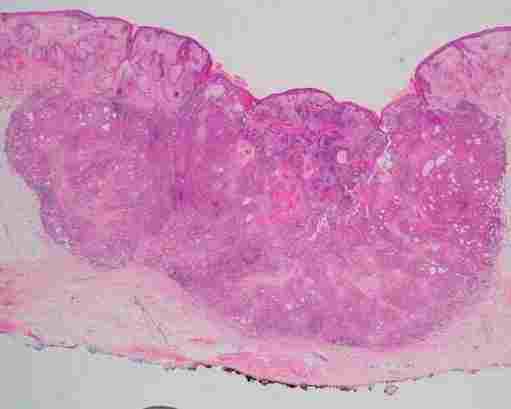 This entry was posted in Research and tagged Cancer, Skin. Bookmark the permalink.